Cape Byron Distillery, the makers of internationally-awarded Brookie’s Byron Gin, has released Mac. By Brookie’s – a roasted macadamia and wattleseed liqueur. The new liqueur is made by steeping roasted macadamia nuts, macadamia nut shell, and wattleseed in a wheat-based neutral spirit – before adding spring water from nearby Wollumbin (Mount Warning) and a touch of natural sugar cane syrup. 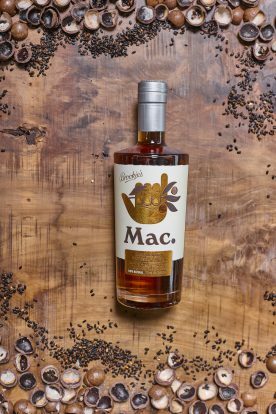 The end result is described as “the ‘Mac Daddy’ of all liqueurs”, with “decadent flavours of butterscotch, cacao and coffee”. Mac. By Brookie’s also makes use of the Brook family’s macadamia farm, the very same property that provides Cape Byron Distillery with its sub-tropical rainforest setting. “We are absolutely stoked to release our latest creation, celebrating the native Australian macadamia nut that the Northern Rivers, NSW region is so world renowned for,” says Eddie Brook, co-founder of Cape Byron Distillery. “We have combined and balanced roasted macadamia with the wonderful native wattleseed into a modern and decadent liqueur. Rich, golden and 100% natural, Mac. has a long-lasting and moreish finish”. In terms of serving suggestions, the team at Cape Byron recommend Mac. on ice with a squeeze of lime, stirred down with whisky and bitters over ice as an Old Fashioned, or mixed through an affogato. The new liqueur (RRP $65) is available through all major wholesalers throughout Australia as well as the Cape Byron Distillery website.